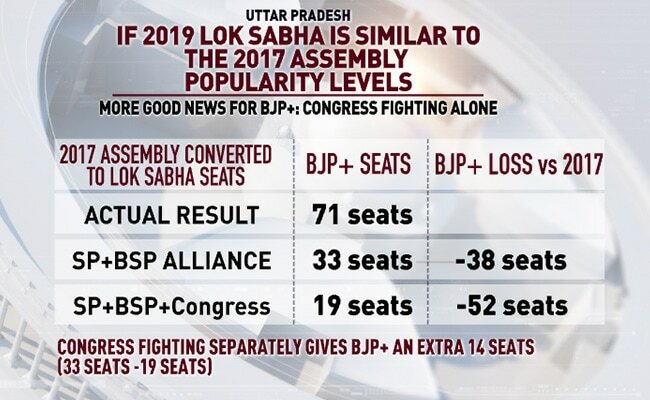 Lok Sabha Elections 2019: The current situation in Uttar Pradesh, where the Congress has been kept out of the Mayawati-Akhilesh Yadav alliance, could add as many as 14 more seats to the BJP numbers, data shows. The opposition alliance in Uttar Pradesh -- the 80-seat state that's considered the gateway to Delhi -- could have a huge impact on the ruling BJP, data from past elections show. The BJP had swept the state in the 2014 national elections, winning 71 seats. Its ally Apna Dal had added two more seats to the tally. Data analysis by NDTV's Prannoy Roy shows that the Mayawati-Akhilesh Yadav combo alone could bring down the NDA score in the state from 73 to 37, even if Prime Minister Narendra Modi's popularity is at the level of the 2014 national election. The addition of Congress to the mix could have deducted another 14 seats from the NDA tally, reducing it to 23 seats, data shows. 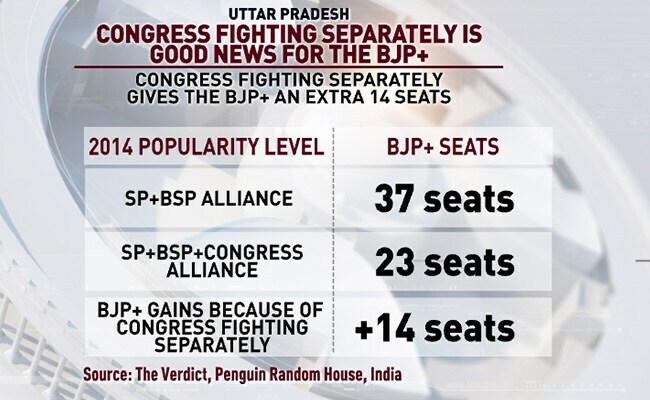 The current situation in the state, where the Congress has been kept out of the Mayawati-Akhilesh Yadav alliance, could add as many as 14 more seats to the BJP numbers, data shows. Both Mayawati and Akhilesh Yadav are resolutely against allowing the Congress to be part of the alliance in the state, which means possible triangular contests in most of the 80 seats, and a split in the anti-BJP vote. Yesterday, Mayawati again gave the Congress the brush-off, responding to its move to leave seven seats for the Samajwadi-BSP Gathbandhan. "The Congress should not create confusion by forcibly trying to leave seven seats for the gathbandhan," Mayawati tweeted. Her alliance partner Akhilesh Yadav told NDTV that as a big party, the Congress "must try to help the other political parties". "For instance, they must try to help Mamata Banerjee in West Bengal. In Delhi, Arvind Kejriwal can fight and they must support them. 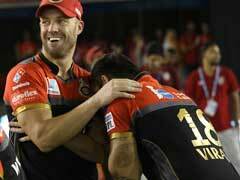 In Uttar Pradesh, we have an alliance ready, they must support us," he told NDTV. A section of local leaders of the Congress admit that being a part of the alliance would have taken them closer to the ultimate goal of defeating the BJP. Others remain sanguine. Senior Congress leader Pramod Tiwari said it would have only meant a difference in the margin of victory. "I have complete confidence that the tally of the Congress and the alliance, taken together, would be 50 to 60 seats. Had we fought together, our tally would have been 90-plus seats and the BJP figures would have shrunk to single digit," he told NDTV.